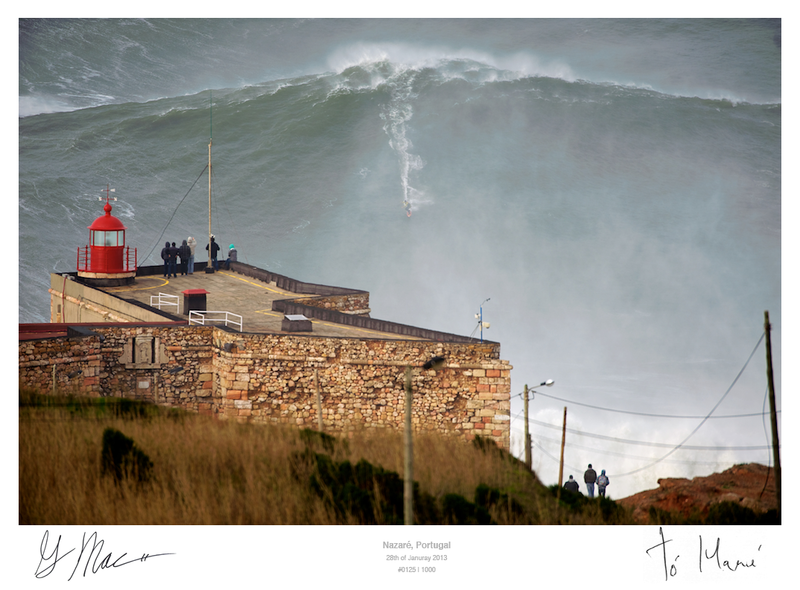 I posted about photographer Tó Mané’s (check out his website, it’s a colourful full screen gallery) attention grabbing photo’s of Garrett McNamara at Praia Do Norte in Nazare, Portugal at the time, well now you can own a limited edition (only 1000 available) print of the most infamous wave of that day for the princely sum of €1000. Signed by both Garrett and Tó, and presented with a certificate of authenticity, it’s a pretty unique piece of surf art, perfect for any corporate headquarters or surf themed bar. I’m planning a more general post about selling prints, one of the possible ways you can actually make some money back from this hobby, so I took notice when I saw his pricing strategy, I like it, there’s no messing about, I hope he sells out. I would love to read more about selling prints and pricing photos! I think I went off the diea of selling prints in the end myself, and as a result I didn’t ever write up another post on it. I might try and bring this topic up again though because I’ve had a couple of people ask about it recently. If I do get around to writing more I’ll let you know.